My review of Parc Esta by MCL. Former Eunosville, next to Eunos MRT. Parc Esta is another new project launch from a previously privatised HUDC site. This could be the test of how hard the latest round of cooling measures has hit the Singapore property market. The project is in an excellent location right next to the MRT station. Parc Esta is a 99-year leasehold condominium developed by MCL Land. It sits on the site of the former privatised HUDC Eunosville along Sims Avenue, just opposite Eunos MRT Station. Back in June 2017, MCL Land acquired Eunosville for $756 million, then the second highest price for a HUDC estate. Eunosville was a 330-unit development built in the 1980s. The acquisition price was more than 17 per cent higher than the $643 million to $653 million that the owners were asking for. The site is 376,713 square feet and has a gross plot ratio of 2.8. MCL Land had to fork out an estimated $194 million in additional governmental charges to top up the lease to a fresh 99 years from the current remaining lease at the point of purchase of 71 years. Each homeowner received about $2.25 million to $2.41 million upon completion of the en bloc sale. The resulting Parc Esta will consist of 1,399 units and it is estimated to sell at about $1,700 to $1,750 per square foot. There will be a mix of 1 to 5 bedroom units. Parc Esta is located right opposite Eunos MRT Station. 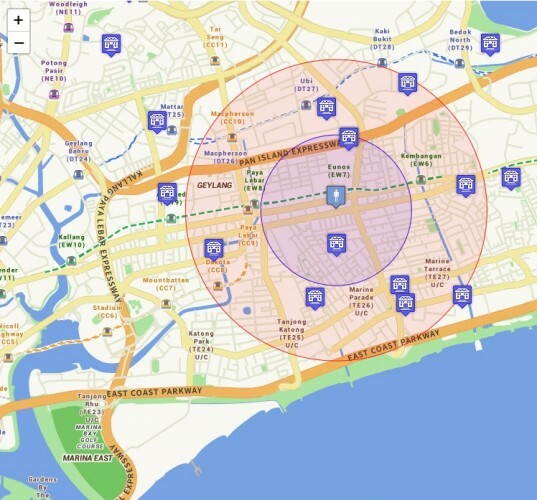 It will take you about 2 minutes to walk to the control station of Eunos MRT Station. There is a shelter leading to the bus stop along Sims Avenue. The only unsheltered portion would be the road crossing at the traffic junction at Sims Avenue. 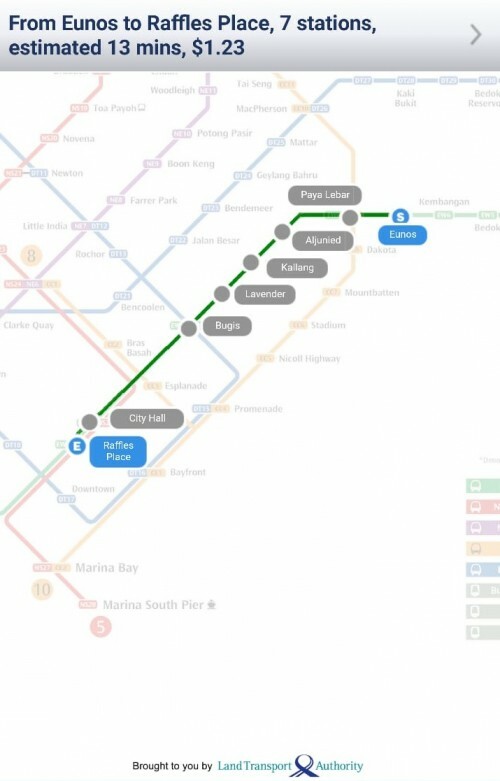 Eunos MRT Station is one stop away from Paya Lebar MRT Station. URA has slated Paya Lebar Central to be a commercial hub. Parc Esta is 600 metres away from the Geylang Serai Market and it will take 7 minutes to walk to the market from the condominium. There are many amenities in the area as well. There is a food centre behind Eunos MRT Station as well as a town centre with clinics and provision shops. 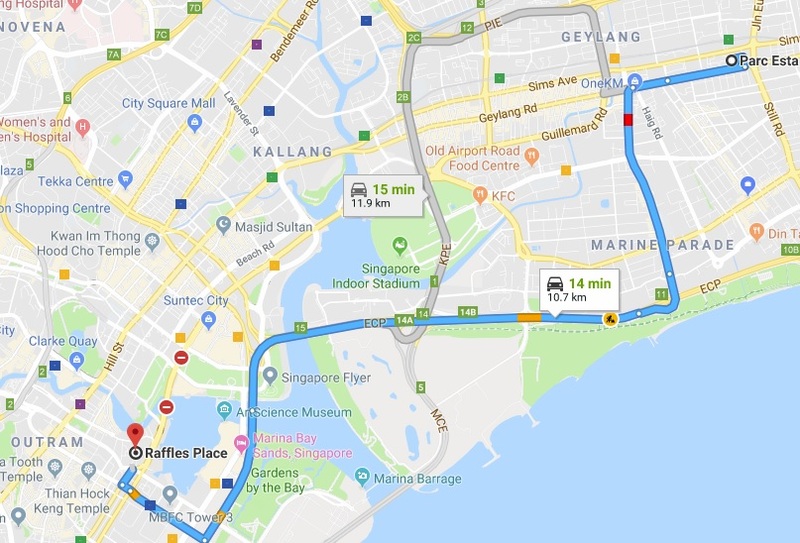 If you are travelling to Singapore’s Central Business District (CBD), it will take you 13 minutes to get from Eunos MRT Station to Raffles Place MRT Station. It will cost you $1.23. If you are going to Orchard MRT Station, it will take you 15 minutes and cost you $1.33. You will need to make a change from the East-West line to the Downtown Line and then to the North-South Line. 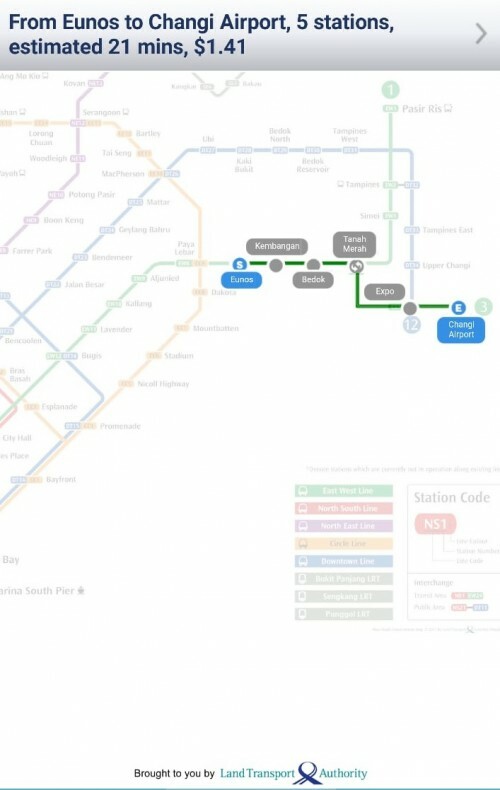 You could alternatively take the East-West Line to City Hall and change to the North-South Line. If you are travelling to Changi Airport MRT Station from Eunos MRT Station it will take you 21 minutes and cost you $1.41. Changi Airport MRT Station is along the East-West Line and thus you will not need to switch to another train line to get to Changi Airport MRT Station. This is especially useful for frequent travellers. If you are driving to Suntec City, it will take you 10 minutes and the distance is about 6.7 kilometres. Do take note that at the point of writing this review it was non-peak hours and traffic was optimal. Peak hour traffic should add significant time to the journey. 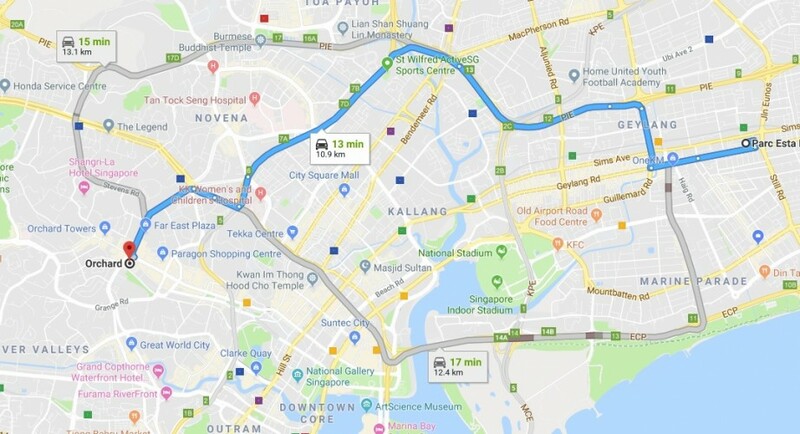 If you are driving to Orchard MRT Station along Orchard Road, it will take you 13 minutes and the distance is 10.9 kilometres. You will need to enter the Pan-Island Expressway (PIE) to get to the CTE to get to Orchard Road. If you are driving to Raffles Place, it will take you 14 minutes and you will need to travel 10.7 kilometres. Using the ECP will get you to the CBD in the fastest time possible. The main selling point is the location. In my opinion, it does not get better than this. Parc Esta is the closest condominium to Eunos MRT Station. 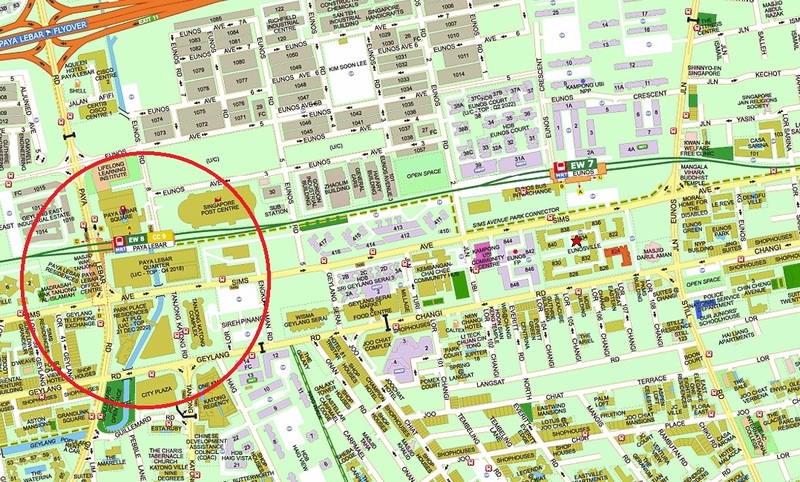 There is currently no condominium nearer to Eunos MRT Station than Parc Esta. The yellow plots of land are reserve sites. I would not expect a residential development to be built on those sites as they are too close to the MRT train tracks. That being said, we cannot guarantee what will happen in the future. The URA Master Plan may change in the future as well. 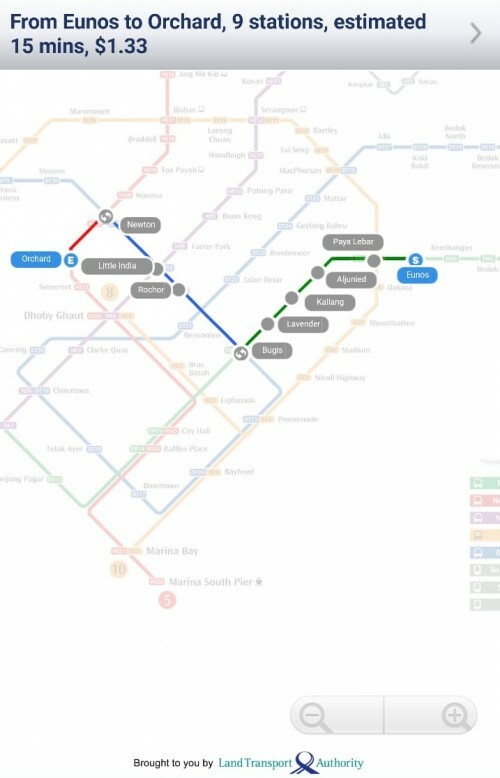 Connectivity wise it is very convenient to get to town or Changi Airport as Eunos MRT Station is located along the East-West Line. I have always maintained that the East-West and North-South Lines, despite their age, are the ones that run through the whole of Singapore as they were the first ones to be built. The subsequent lines are, in my opinion, there to complement the older lines. There is an advantage of living in a matured estate rather than a new town. Amenities wise, a matured estate like Eunos will have more hawker centres, wet markets, provision shops in the vicinity. Compare this to a new town like Woodleigh where such amenities are lacking. 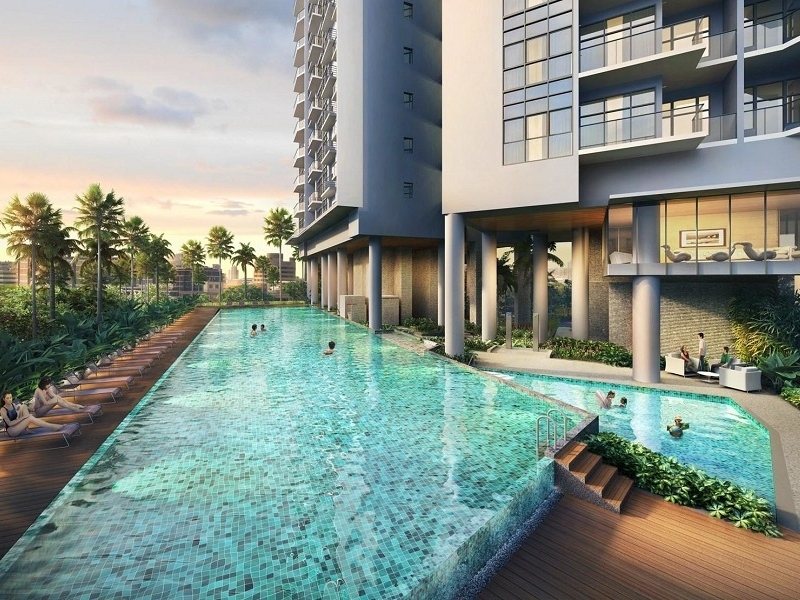 Parc Esta is also close to Parkway Parade and is two MRT Stations away from Bedok MRT Station. You can also travel to East Coast Park easily by car. There are many primary schools around the vicinity as well. This is also another advantage of purchasing a development in a matured estate. There are usually more schools for parents to choose from. 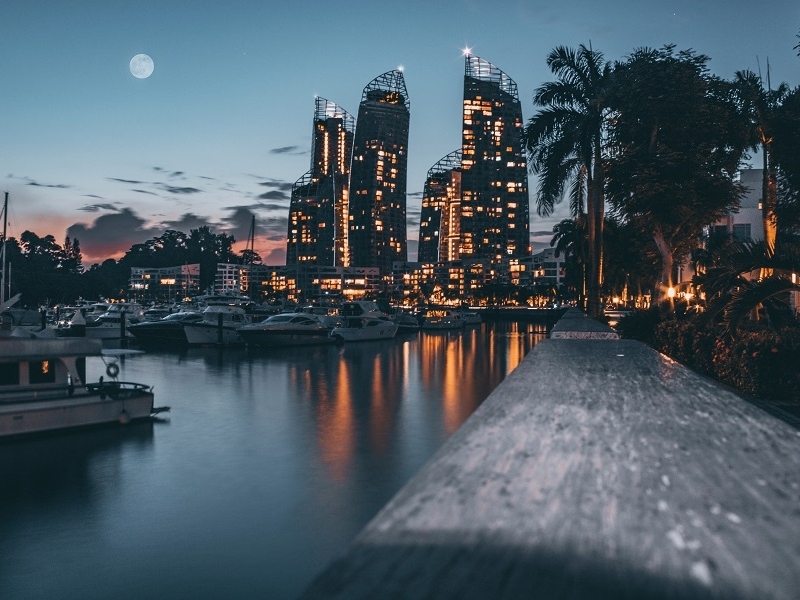 Parc Esta is within a 1-kilometre radius to Haig Girls School and within a 2-kilometre radius to Maha Bodhi School, CHIJ Katong Primary, Tanjong Katong Primary, Tao Nan School, St Stephen’s School, Kong Hwa School and Telok Kurau Primary School. 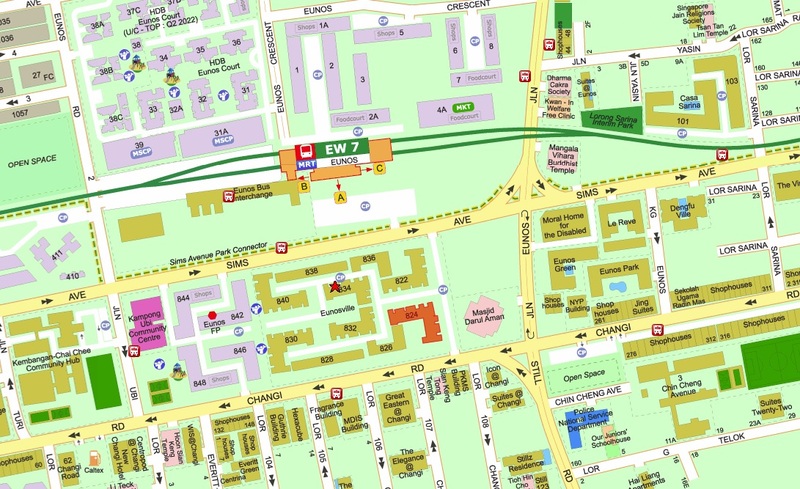 Eunos MRT Station is also located one MRT Station away from Paya Lebar MRT Station where Paya Lebar Central is located. 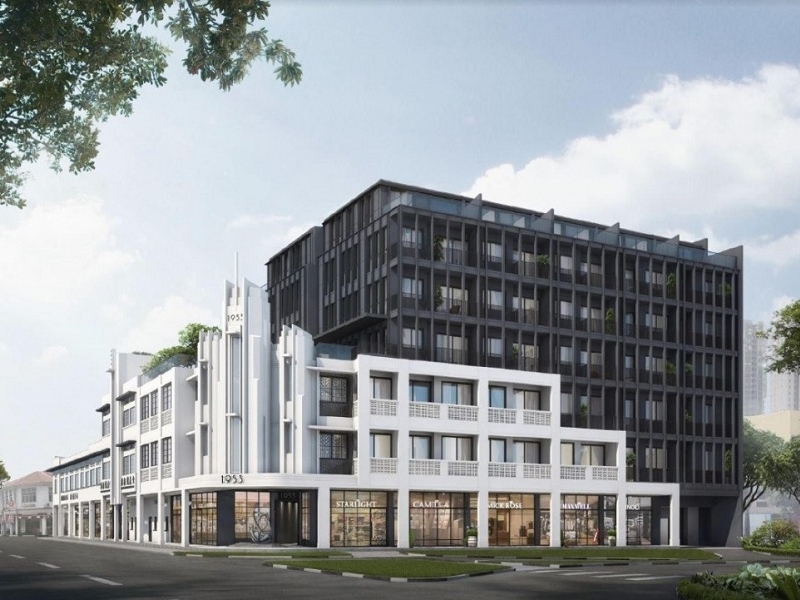 The Paya Lebar area is undergoing a transformation to become a commercial hub. There are many commercial and residential developments in the area which should attract businesses and residents to the area. Tenants may come from that area as Parc Esta is just one MRT station away from Paya Lebar MRT Station. It is difficult to find an equal comparison for Parc Esta as Parc Esta is a large development situated extremely close to an MRT Station. For my basis of comparison, I shall refer to the uncompleted Park Place Residences and the completed Bedok Residences which are one and two MRT stops away respectively. 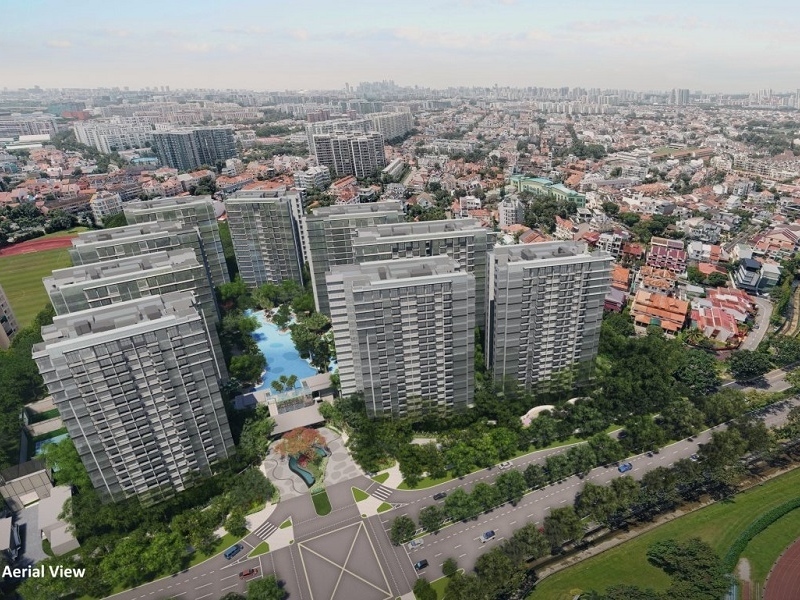 Park Place Residences is a 429 unit development in Paya Lebar Quarters and is developed by Lendlease. It is located right next to Paya Lebar MRT Station. To date, 401 units out of the 429 units have been sold. The median price is $1,695 per square foot but if you consider that the project was launched in two phases with the earlier phase at cheaper prices, current prices are higher than the stated $1,695 per square foot. 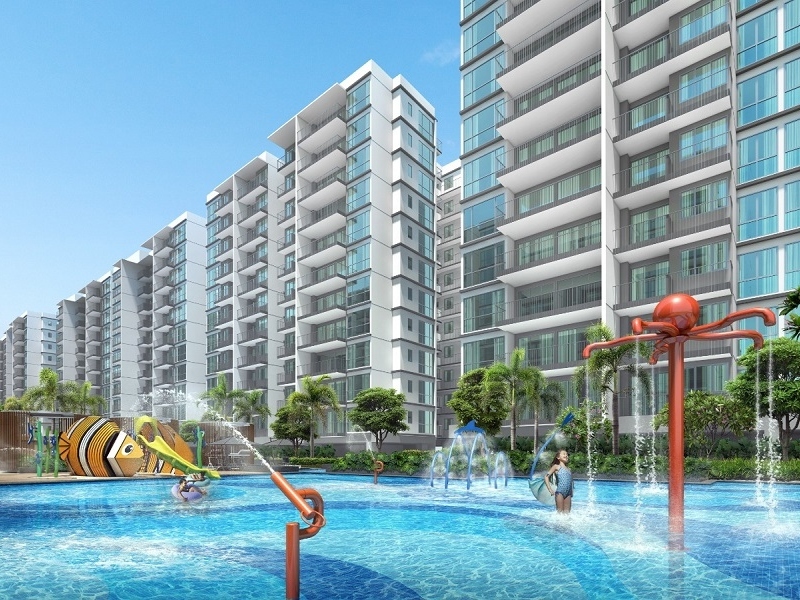 Bedok Residences is a 99-year leasehold development with 583 units. It is located right next to Bedok MRT Station. It completed in 2015 and residents have been living in the development for the last 3 years. In the last 3 months, per square foot prices in the resale market ranged from $1,456 to $1,661 per square foot. The 99-year lease started in 2011 and thus there are 92 years left on the lease. Prices for Parc Esta are expected to be around $1,750 per square foot. There are advantages to being in a large development. There are more residents to share the burden of maintaining the estate and its facilities and consequently, maintenance charges should be lower. Also, because there are more residents, facilities should be more comprehensive. This is the highest I have given a development. I still feel that paying $1,700 per square foot is rather high but then there is no development as close as this to Eunos MRT Station. Also, if you compare prices to what is being sold in Park Place Residences the pricing seems similar and in fact, certain units in Park Place Residences have crossed $2,000 per square foot. 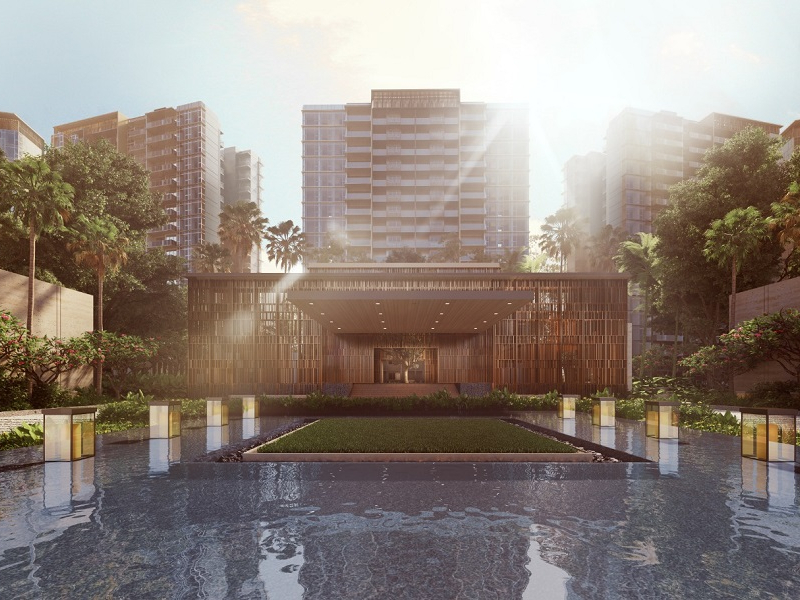 If you then compare Parc Esta to the already completed Bedok Residences, then the premium for a new project launch does not seem as much as other locations. In my other reviews, I spoke of Jui Residences commanding a 49% premium over the resale market. 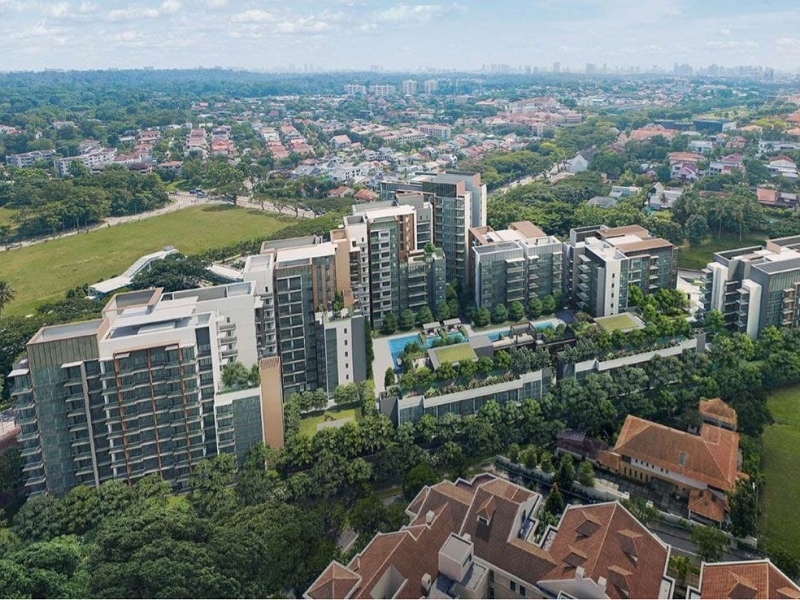 Also, developments like the 99-year leasehold Affinity at Serangoon and The Garden Residences are commanding prices in excess of $1,600 per square foot when the neighbouring 999-year leasehold Kensington Park Condominium had transactions in the $800 to 900 per square foot range. Again, a very high score. If I could have one gripe about the location is that there is no shopping mall with a cinema. Even though it sounds like I am nitpicking, it is a deal breaker for some home buyers or tenants but then these are few and far between in numbers. Parc Esta is very centrally located and you can travel easily via the MRT system or if you are driving, getting to town is very convenient. East Coast Park, i12 Katong and Parkway Parade are also close by. There is no shortage of food or amenities options in the area. It is also surrounded by good schools so it is a possible purchase for families with young children. I previously reviewed another development by MCL Land named Margaret Ville. In that review, I gave the development a 3.5/5 score as well. I will maintain this score for this section as the developer has yet to release any rendering or details about the development. I personally felt that Margaret Ville needed to be impressive from a design and facilities standpoint. It is competing with so many developments in the Queenstown area and yet it is one of the furthest development from the MRT Stations. I do think that in Parc Esta, MCL Land has a very good plot of land in a very good location. Disclaimer: My agency is the marketing agent for Parc Esta and I can earn a commission if I bring a potential buyer to buy a unit at Parc Esta. However, in my writing of my property reviews, I have always maintained a balanced and neutral view, pointing out the potential advantages and disadvantages of the various new project launches. I write my reviews from the viewpoint of a potential property buyer and not as a property agent. My purpose for this review is to share my thoughts and my research about the project with potential buyers to aid them in their buying decision. P.S. You can reference the Parc Esta floor plans here.